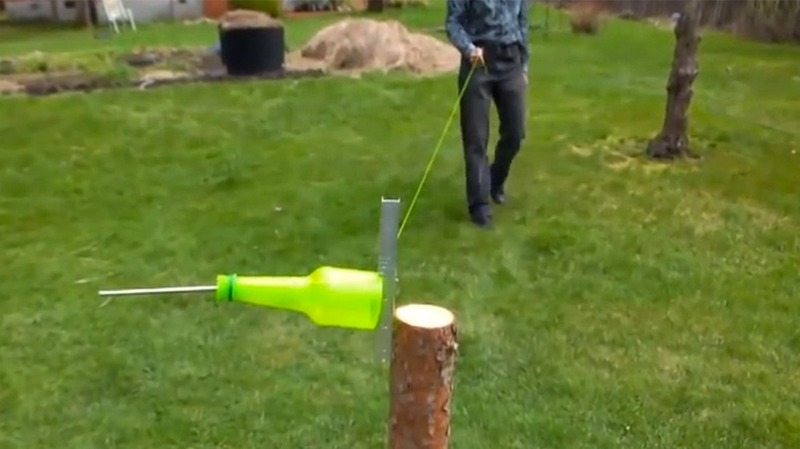 This is evil genius; an innovative way of reducing plastic waste by making ropes out of used plastic bottles. All you need is a simple bottle-cutting contraption that is improvised as shown by our innovator-of-the-day – Lawyer Egorov. The two-part video showcased here, walks us through the process of reducing a bottle to a ribbon and then its possible uses. The first step in the process is to set up the bottle cutter and then to slide in the bottle. As soon as you get the first thread, you simple pull it till the bottle is completely transformed to a rope or ribbon – depending upon the width you cut it. Egorov shows us the various uses of the ribbon – for example using it to bind wood and making a stool or a chair – to reinforce its durability he heats it up with a heat-blower. This shrinks the plastic rope to make it more binding and strong. The videos are not in English but have subtitles that relay all the information. Take a look and get inspired.